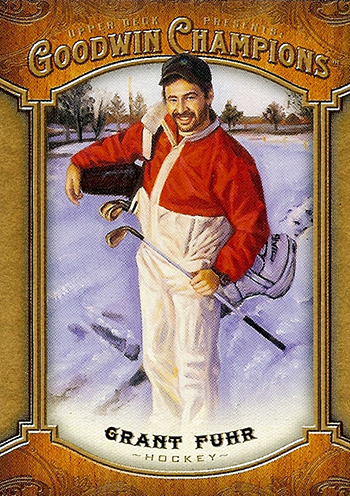 One of my personal favorite cards in the set is of legendary goalie Grant Fuhr playing golf. 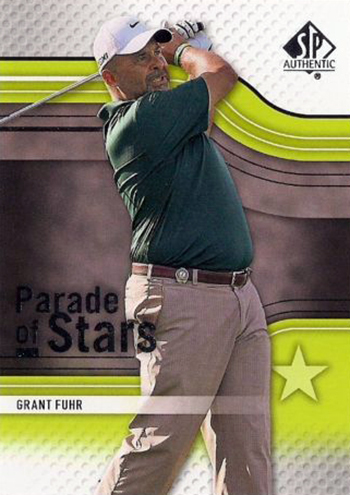 And if you didn’t already know, Grant Fuhr is actually a pretty darn good golfer who has actually been featured in an Upper Deck Golf set before. What I love about this 2014 Goodwin Champions card of Fuhr however is how the elements he is playing in do not seem to bother him at all. So let’s put up a new card of an older player for Throwback Thursday and see if our fans can come up with some great captions for the card! 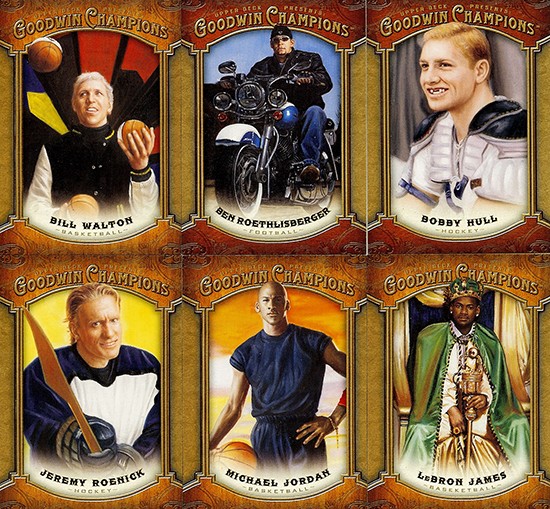 Please share your comical caption to this card for your opportunity to score the below 6 packs of 2014 Goodwin Champions for your chance to pull one of your own! Give this card a caption and score some new 2014 Goodwin Champions packs! Comments are moderated so keep them clean and in good taste as we have a lot of youngsters on these pages. Comments deemed inappropriate will not be posted or eligible to score the packs. You have until Monday morning, July 7 at 8:00 a.m. PT to post your caption before this promotion is closed. Only the customer selected to receive the packs set will be contacted via email, so please make sure to provide an accurate email address when you leave your comment. I’m so awesome I chop down trees to make my own goalie sticks. Top that Chuck Norris. In the snow, its nothing but hole in ones….its a Canadian thing. You know, I feel like I’m getting closer to the South Hole! Playing August golf in Canada makes me FUHRious! Problem with the revolutionary Gaders! Ready to take care of the fifth hole! That’s why Grant Fuhr only uses Molson golf clubs. The club that drives like a hockey stick. Snow golf is for the penguins, not the blues! Grant Fuhr: Greatest goaltender to ever play on the link rink. With a “good win” on this course, I can be the “champion”. Congrats to Jason on scoring 2014 Goodwin Champions! Thanks to everyone for participating and hope to see all of your witty comments again at the next Create the Caption promotion.